a breed of beef cattle, a variant of the Galloway breed. It is polled and black except for a genetically dominant wide band of white completely encircling its trunk behind the elbow. Belted Galloway beef has been described as tender, sweet and juicy--giving it great market appeal. Backer coaxes a couple of recent additions - young belted Galloway beef cows - toward him. And Jane Smith in Usk launches a website celebrating her beloved belted Galloway cattle. We received multiple similar responses from our readers regarding our successful GRIT Belted Galloway Heifer Giveaway. She rejoiced in the creation of the Breakneck Hill Cow Fund so the herd of Belted Galloway cows would remain on the property. 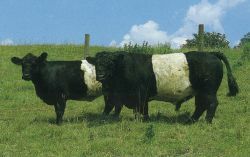 These are some of the author's Belted Galloway cattle, also an endangered species. Daniel Farm has introduced rare breeds such as Belted Galloway, Beef Shorthorn and Tamworth pigs - British native breeds that we are helping thrive again in the North East. Now my care goes to my small herd of Belted Galloway cattle, my horses, and miscellaneous critters. Ruefully, she says that from July to September it takes over her life, but she does also breed and show Belted Galloway cattle and Gloucester Old Spot pigs and is secretary of the Bleu de Maine sheep society. Flora Stuart, 63, was president of the Belted Galloway Cattle Society for more than 20 years and died of liver cancer in February. 5p and was paid to T A Byers, Ellen Bank, Boltongate for a Belted Galloway which was purchased by M Wharton, Wholesale Meats, Wigton. Though distantly related, the Galloway and Belted Galloway are genetically distinct.